This addon adds a number of powerful features to provide a smooth cross-faction roleplay experience! When your Elixir of Tongues is running out, it'll give you a popup* to refresh it. A simple interface to make it appear like you're whispering using your character. Requires you to be Battle.net friends with the recipient (for privacy/security). Supports the glorified whisper addon, WIM! RP profiles traded cross-faction and cross-realm. How does it work? IT JUST WORKS. You can see what realms and factions you're "connected" to by mousing over the minimap button. 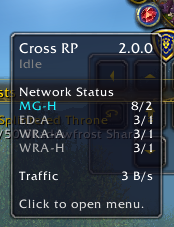 For cross-faction events, Cross RP can link groups to enable shared chat (/rp) and /rolls. Useful also for same-faction events involving multiple raid groups. It seems that Cross RP and Auctioneer don't want to cooperate. After installing Cross RP, I get the following error each time I log in. Actually, it's three errors, all identical except for the Message, which identifies three different objects that already exist: MSA_DropDownMenuButtonTemplate, MSA_DropDownListTemplate, and MSA_DropDownMenuTemplate. I hope this is helpful. Those warnings are harmless and will be fixed...eventually. It just means that two addons have the dropdown library loaded, and it's a bit quirky how that works out, so there's those warnings. I'll remove this if you don't want that, though. As convenient and good-willed this addon is, Blizzard is now banning people for using the addon. There have been multiple troll ban reports and this is likely unrelated. Turns out you were right - This might have been a troll attempt. I am having a little problem with seeing other's TRPs through the channel. I have their TRPs pop up, but it's stuck as 'Unknown' and won't go further. Everything else, however, seems to be working fine! I am loving this add-on already and cannot praise it enough. Hi Tammy! I just wanted to thank you for this amazing addon! I'm on WrA and lead a cross faction guild, and it all possible thanks to you! I have noticed one small issue that I don't believe anyone else has mentioned yet. When you type %t or %f in chat, they do not show up as your target/focus to players of the other faction. This is just a minor issue, when my cross faction group noticed it, we just worked around it and stop being lazy and actually typed out people's names...or shift click their names rather. I've noticed this too, but I'm not sure there's a fix. The way this addon works is that it copies exactly what you've typed, so it doesn't register the %t command and will just type out %t. Yeah, I know that you can do %t to show up in normal whispers, guild, and other channels, but anything connected to battlenet remains and %t, my guess is that it COULD be done so that it converts, but it would probably take a lot of coding, its not that big of an issue, I just have to break my habit of being to lazy to type people's names or shift clicking their names! The base of the addon is really nice and convenient to use - great UI. I'd like to suggest that the addon auto-disables when logging out, so protect user's interest in remaining invisible, if they don't wish to be disturbed. Right now, if a user forget to do this before logging out, it shows when they log online, even if they have Offline toggled on. There's already some players considered part of the community who have voiced that they are not comfortable sharing their b-tag information with anyone and everyone. Some people have highlighted that it's only the community moderators who are able to see those b-tags if a few settings are arranged appropriately. This is not true; you can still see B-tags and character names associated with B-tags through your Battle.net Social Tab, even if it doesn't show up in-game. Thank you for the attention and effort in developing this addon - if there is a way to work out these concerns, so that all users feels safe when using it, I will make sure to use it for my next big event and promote the feature! They should atleast let us nickname our accounts, so that upfront doesn't show our bnet, but like as discord is. Understandable concerns really, and Cross RP does its best to try and be intuitive as possible. If you log out for 15 minutes, it doesn't turn on the relay automatically, so won't send a login message. Currently the Battle.net API WoW provides is a bit feature lacking so a few things should improve in the future as we see more development in that regard on their end. As for Btag name connections, this is an unfortunate side effect of using the Blizzard Groups. Some things are planned for the future to at least make names not easily readable; but for real privacy, you need to set up your own community (which is meant to be an easy thing to do also!). Yeah I figured there would be restrictions out from Blizzard's set up. Another question is if there would be any way to develop a cross faction communication addon, so that it did not go about the community feature, but instead just added the enable/disable button in the ui, to let those who has the addon talk together, without being obligated to join a community at all? I heard a rumour about the GHI, that someone found a way to hack the barrier with the addon, to get access to X-faction communication. If it's been done before, it must be possible to do again, and if the ToA has changed, then I think it would be worth investigating. I understand that it is a stray away from the initial tactic, but on the goal of giving access to X-faction, I think it's be a major boost, if it would be possible to give access without obligations. While that would be convenient from a user's perspective, addons that work around the barrier in those sorts of ways can be considered exploits. 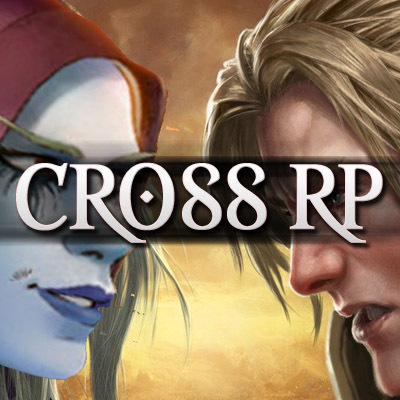 Cross RP doesn't do anything questionable and relies on the new community features. In other words, it's just BfA's new features that make this possible, and not some newly discovered exploit. Would it be possible by chance to implement so the /e and /s /y of those who do NOT have the addon are still displayed in general chat for those who do and the text is not hidden? As it is currently, it makes it difficult to interact with people from the other side who do not have the addon, as I cannot tell if that person is trying to interact with me or not. I see nothing, so I don't know if they are attempting RP. I sometimes manage to catch glimpses of the scrambled Orcish in the chat bubbles, but that's quite difficult to spot. It's on the todo list...somewhere. It's not super easy to keep showing those messages without causing other little problems. I'd personally recommend against probing random people, as not everyone might be inclined to the idea of some addon that lets them interact with the other faction. Some prefer their world to be at unquestionable war with the other races!